FFA - Governor Sam Brownback and Kansas Legislature pass American Laws for American Courts legislation which blocks Islamic Sharia law. 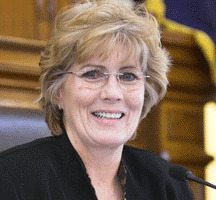 Kansas State Representative Peggy Mast fought hard for two years to get this legislation passed. Kansas Senate votes 33-4 and Kansas House votes 120-0 to approve bill titled “Concerning the protection of rights granted under the Constitution." Supporters emails helped make a difference. Kansas Governor Sam Brownback has signed legislation blocking courts from recognizing Islamic Sharia law. Kansas Governor Sam Brownback signed legislation late the week of May 25, 2012 titled “Concerning the protection of rights granted under the Constitution" which prohibits Kansas state courts from recognizing foreign laws including Islamic Sharia law. There were reports that members of the Council on American Islamic Relations targeted the governor with opposing phone calls and emails urging him to veto the legislation. However, sponsors of the bill and authors of the legislation knowing the situation first hand requested that Florida Family Association supporters not bombard Governor Brownback with emails. Florida Family Association respected that request by not calling on supporters to send emails. Florida Family Association sent out the three email alerts posted below which encouraged supporters to send emails to legislators. Supporters sent more than 60,000 total emails with approximately 9,000 emails going to each Senator on the Kansas Judiciary Committee and Kansas Governor Sam Brownback. Florida Family Association supporters emails helped make a difference in this important effort. A special thanks to the Center for Security Policy for their leadership in advancing this American Laws for American Courts legislation. Email alert dated March 27, 2012. Kansas bill titled “Concerning the protection of rights granted under the Constitution" which prohibits courts from accepting Sharia law goes to conference committee. Please send your email to conference committee. Florida Family Association sent out two email alerts earlier this year regarding American Laws for American Courts legislation HB 2087 which passed the Kansas House of Representatives last year by a vote of 122-2. Both alerts are posted at the end of this email. The Chair of the Kansas Senate Judiciary Committee would not give HB 2087 a hearing. However, the Kansas House leadership rescued the legislation by creating House Substitute SB 79 for a bill already passed by the Kansas Senate. House Substitute SB 79 titled “Concerning the protection of rights granted under the Constitution" appears to be the same text as HB 2087 only with a different title. The Kansas House of Representatives unanimously approved House Substitute SB 79 on March 21, 2012 by a vote of 122-0. Since House Substitute SB 79 is legislation for a bill previously approved by the full Kansas Senate the legislation goes to conference committee. The conference committee convenes on March 27, 2012. It is possible the conference committee could review the House Substitute SB 79 as early as March 27, 2012 as it considers other business. Florida Family Association has prepared an email for you to send urging the six members on the conference committee along with Kansas Governor Sam Brownback to approve House Substitute SB 79 titled “Concerning the protection of rights granted under the Constitution." To send your email, please click the following link, enter your name and email address then click the "Send Your Message" button. Because opponents try to use our email system to send opposing messages we NO longer allow for changes in the wording of the subject line or message of the email prepared for you to send to advertisers. Please click here to send your email to the conference committee along with Kansas Governor Sam Brownback. Email alert dated February 21, 2012. Islamists campaign against Kansas legislation forbidding consideration of Sharia law in Kansas Courts. Passage of bill appears to rest with 4 more Senators. 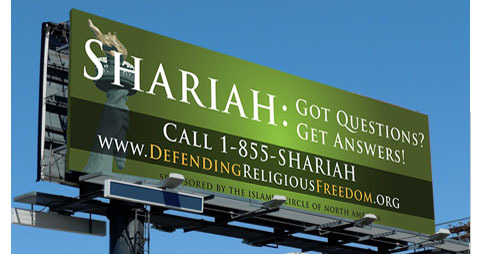 Islamic Circle of North America is sponsoring adjacent billboard in Kansas. Please send your email to Senate Judiciary Commitee and Governor. The alert reported that the Kansas House of Representatives voted 122 to 2 in favor of passing HB 2087 titled “Concerning the protection of rights granted under the constitution” on March 30, 2011 but the bill has been stuck in the Senate Judiciary Committee ever since. The full original email is posted below. Email alert dated February 13, 2012. Pro-Sharia Islamic forces are rallying against Kansas legislation which would prohibit courts from considering Sharia law. Please send your email to Senate Judiciary Committee. The Kansas House of Representatives voted 122 to 2 in favor of passing HB 2087 titled “Concerning the protection of rights granted under the constitution” on March 30, 2011. This legislation would prohibit Kansas courts from recognizing "foreign laws" which would include Islamic Sharia law. Click here to read more about HB 2087 at the State of Kansas website. Unfortunately HB 2087 has sat in the Kansas Senate Judiciary Committee for almost a year after passing the house 122 to 2. HB 2087 has been carried over into the 2012 session. Kansas Senator Julia Lynn gave the following report on her website regarding HB 2087 on February 4, 2012. "Sharia Law addressed in Committee. Senate Judiciary had two days of hearings on HB 2087 concerning protection of rights under the US Constitution. The bill protects the constitutional rights of Kansas citizens from incursion of foreign laws and foreign legal doctrines. The hearings included disturbing testimony from federal agents and Kansas attorneys who work with our courts and effected citizens who seek protection from the practice of Sharia Law being administered in our courts. Click here to read Senator Lynn’s report." However, no vote was taken on February 3rd or 4th in the Senate Judiciary Committee on HB 2087. Why is HB 2087 being delayed? Maybe it is because opponents including The Islamic Circle of North America are rallying against this legislation which affirms that only American Laws should be considered in American Courts. The Islamic Circle of North America is engaging in a billboard and radio ad campaign in Kansas. Please show your support for Kansas' American Laws for American Courts legislation by sending the email that Florida Family Association has prepared which encourages the Kansas Senate Judiciary Committee members to pass HB 2087.